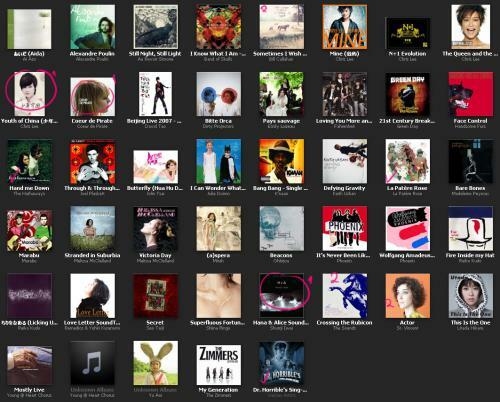 Keeping my iTunes in Order | personal.amy-wong.com - A Blog by Amy Wong. See? Neat~~~ almost everything with a cover, but that’s because I ripped that from a YouTube video, which is lame… but I couldn’t find a proper mp3 of Sedated by the Young @ Heart Chorus. Do you know where can I get it? Then… circled albums are the ones I don’t own, and want to buy physically… the ones marked with a “2” means I would be thinking of getting them physically as well. I really, really have fallen in love with the Hana & Alice OST, it goes with liking the film more and more. The rest, as you can see is filled with Chris Lee, Coeur de Pirate, David Tao, Dirty Projectors, Green Day, The Sounds, St. Vincent, La Patere Rose etc etc… Shiina Ringo, Seo Taiji. When is Seo Taiji’s 8th album coming out??? I’ve been waiting for it since October last year – I remember because I was complaning too many albums coming on Oct/Nov.